Another dry week at San Roque, although high winds made conditions very testing at times. 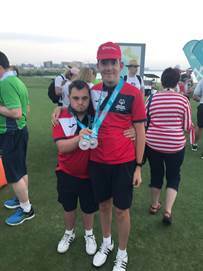 Before I reveal last week’s results, I am delighted to report that Mark Emery’s students, Nicholas and Julian, both won individual silver medals in golf events at the Special Olympics! You may recall a very enjoyable fundraising day at the Club earlier this year when both athletes received the latest set of clubs from Callaway – well those clubs worked the oracle and on behalf of all members, I would like to congratulate Nicholas and Julian on their success in Abu Dhabi – I would also like to congratulate Mark on a tremendous coaching achievement – you have all made San Roque and Gibraltar very proud! On the Costa del Sol, a round of golf can be enjoyed at any time of year. Boasting a whopping 300 days of sunshine, views of the Mediterranean Sea and mountains, as well as some of Europe's most renowned golf courses, this picturesque part of the world provides the perfect setting in which to perfect one's swing. Whether you’re a local resident, a regular visitor to the Costa del Sol or are planning a golfing holiday in the area, there’s a golf course and resort that’ll suit you down to a tee.